According to a study conducted by The Bureau of Investigative Journalism, the United States Government spent more than $500 million dollars to produce fake Al Qaeda propaganda videos. According to the report, the Pentagon dolled out about $540 million to a U.K. P.R. firm between 2007 and 2011 to make fabricated propaganda videos as part of a secret campaign to deter potential terrorists or track those who followed along. Since it is against the law for the U.S. to create propaganda videos to use on its population, the Government had to accomplish the task through a foreign firm. The P.R. 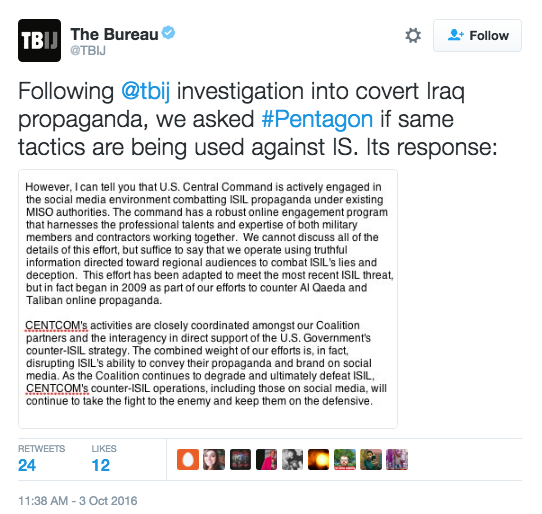 firm, Bell Pottinger, was hired by the U.S. to work with the C.I.A., the National Security Council, and the Pentagon to produce Al Qaeda style videos aiming to cast the terror group in a negative light. According to the report, the firm developed TV ads and scripted Arabic soap operas where actors playing Al Qaeda members would act out scenes where they would reject committing acts of violence and subsequently be met with positive consequences. The P.R. firm also hired crews to videotape bombs exploding using low quality cameras and edit the film to look like news coverage to make it seem legitimate. Lord Bell was in charge of running the secret propaganda work produced at Bell Pottinger. Some videos were produced to be planted in the homes that the military raided. A DVD would be left with a video file that was specifically formatted to play only on Real Player, an application that needs the internet to run. When the video was played, the Military could use Google Analytics to track the IP address. 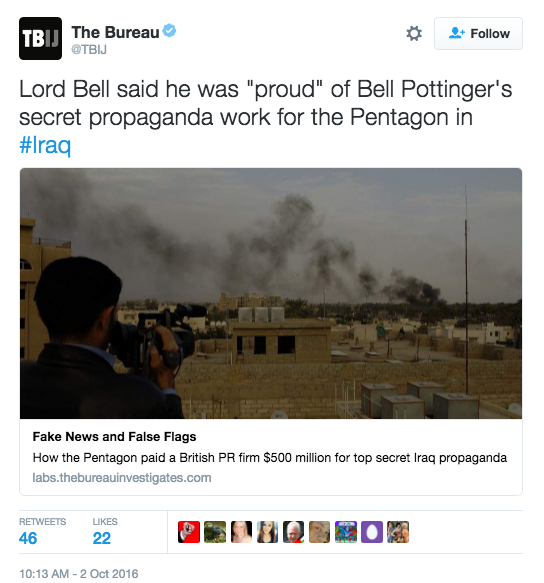 Wells reported that planted videos had been tracked to Iran, Syria, and the U.S..
Bell Pottinger is known for having controversial clients and being involved in some arguably unethical projects. It’s been reported that the firm took on jobs that polished the images of countries who had been accused of committing horrible human rights violations. Their clients include the Saudi Government and the Chilean dictator’s foundation.